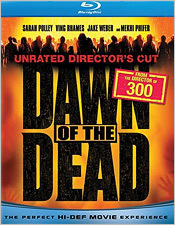 As the astonishingly ugly blurb splashed across the cover of this disc trumpets, Dawn of the Dead is from Zack Snyder, the director of 300 (Universal must not have got the memo that he is now the “visionary” director of 300). Back in 2004, that name meant a whole lot of nothing to horror fans around the world. All we knew is that some hack music video and commercial director (because in cases like this, virtually all video and commercial directors are hacks until proven innocent) had the balls to think he could remake George A. Romero’s 1978 classic. And make no mistake, Romero’s movie is indeed a classic. Go back and rewatch it. You’ll find it stands the test of time better than just about any of its contemporaries. Consequently, the very idea of a remake seemed downright blasphemous and Snyder’s movie was anticipated with what can kindly be called skepticism. Together, Snyder and Gunn took Romero’s work as a launching pad and made a movie that honors and respects the original without ever imitating it. But while the remake is highly entertaining, it’s never quite as great as the original. It starts off well enough with a powerhouse opening sequence that ranks among the most effective in recent years. The movie is full of wonderful moments but at the end, they remain just moments. There’s never the sense that the movie is actually about something larger and deeper like the original. That’s OK. Not every movie has to carry with it a profound message. But the difference is what makes Romero’s work an enduring masterpiece and leaves Snyder’s remake, for all its merits, simply a very good horror movie. Universal’s iffy track record with Blu-ray continues with this release. The image is quite nice with solid detail. Since it’s such a recent film, there was presumably not a lot of digital clean-up work done to the picture. This appears to simply be a high-def transfer of the film as shot. It looks a bit better than it did on DVD, although this isn’t one of those movies where the difference is jaw-dropping. The DTS-HD audio, on the other hand, will rattle the glass in your windowpanes. As for the extras, as is the case with The Thing, Universal has decided to give us the greatest hits of the bonus features from the previous DVD release. You still get the commentary by Zack Snyder and producer Eric Newman. It’s not too shabby although I wouldn’t exactly call it essential. Other bits and bobs (interviews and the like) can be found using the inane U-Control picture-in-picture feature. Breaking news: I still really hate the U-Control thing when it’s not being used for something specifically designed for it. And once again, some of the extras from previous editions are AWOL. Say goodbye to the news reports and to the short The Lost Tape: Andy’s Terrifying Last Days Revealed. Unfortunately, we are continuing to see the aftershocks of the new Dawn of the Dead. I believe that it’s thanks to the success of this movie that we’ve seen remakes of everything from The Texas Chainsaw Massacre to Prom Night. Despite this, it shouldn’t take away from what Snyder and Gunn accomplished here. Their movie is much better than anyone had any reasonable expectation it should be. I’m not a fan of remakes, especially of movies less than 30 years old, but this is a remake done right. As for the Blu-ray, if you want to upgrade to high-def but keep the extras, you’d better hang on to that DVD. And if you have the HD-DVD edition, I wouldn’t bother with this at all.